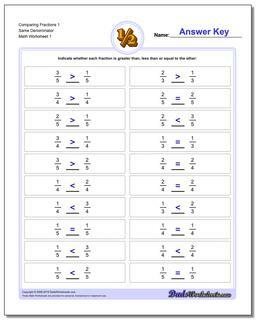 This page contains links to free math worksheets for Comparing Fractions problems. Click one of the buttons below to see all of the worksheets in each set. You can also use the 'Worksheets' menu on the side of this page to find worksheets on other math topics. Once students have a basic familiarity with fractions, the next step is to understand how to compare fractions. Sometimes the concept of denominators takes a little time to grasp. Often students will confuse a larger denominator with a larger value for the fraction, when in reality the numerator, not the denominator, expressed the actual value being represented. The size of the numerator relative to the denominator is what ultimately describes the actual value of the fraction. A way to address this is to learn how to compare fractions and find common denominators so that two fractions can be numerically compared clearly. The worksheets on this page provide exercises to do exactly that, and they are good practice for the steps necessary for other fraction operations.